Got tired of preparing plain dosa? Looking for a tasty twist from the regular dosa? 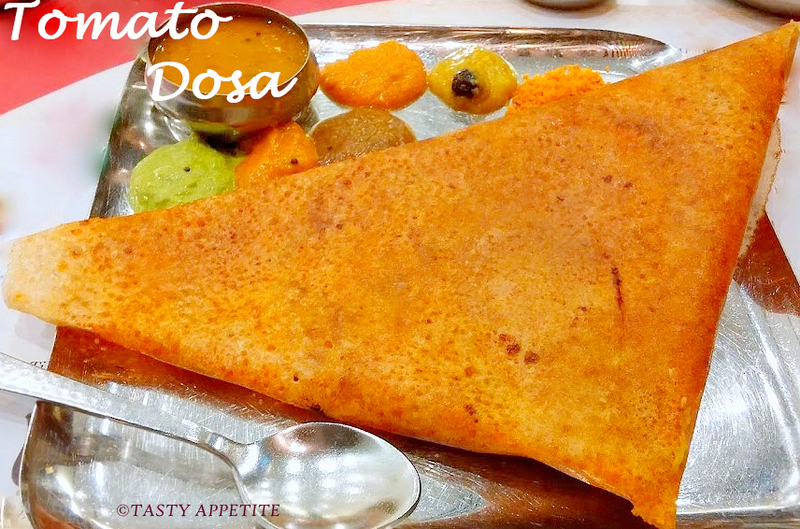 Then here you have the Instant Tomato Dosa recipe that tastes tangy and spicy with an awesome tomato flavor. Also kids enjoy this dosa as it got a gorgeous color and the soft crisp texture of it. I prepared this for weekend breakfast and everyone.. loved it. Do try this easy recipe and share your views..! 1. Wash and soak raw rice for 4 to 6 hours. 2. Wash and soak poha for 10 mins. 3. Chop onions, tomatoes to slices. 4. Drain the water from the rice and add it to blender. 5. Add soaked poha, onion, tomato, red chilly, garlic, cumin seeds, hing, saunf and salt. 6. Grind them to smooth batter by adding enough water. 7. Transfer to bowl. Add pepper pwd. 8. Sprinkle freshly chopped coriander leaves. Mix well. 9. Check the consistency of the batter. If required add little water so that the consistency is of smooth flowing. 11. Grease it with oil when the tawa is hot. 12. Pour a ladlefull of batter and spread it in concentric circles. 14. Cover and cook it in medium flame for 2 to 3 mins. 15. Once the bottom side turns golden brown and crisp on edges, fold the dosa in triangular shape. 16. Healthy Tomato Dosa is ready. 17. Relish hot with chutneys, sambar or any other dip of your choice. yes Jyothi, rice can be substituted with bajra, jowar or even brown rice is fine.